Schwarzenegger, with their bulging Chris Redfield muscles and John McClain vests. To fight robots you use robots, especially when you consider the feats your player character over comes. How can any organic man jump from rocket to rocket firing a flame thrower as he leaps? Can your average Joe cling onto a helicopter with one arm while firing a grenade launcher with the other? (However it is important to remember that there’s no bigger hero than a nineties’ action hero!) So for me it’s a simple answer to the question that has tested the greatest minds, it’s not Contra 3, its Super Probotector. Its robots, not commando men. runs for this game and they are very impressive to watch. 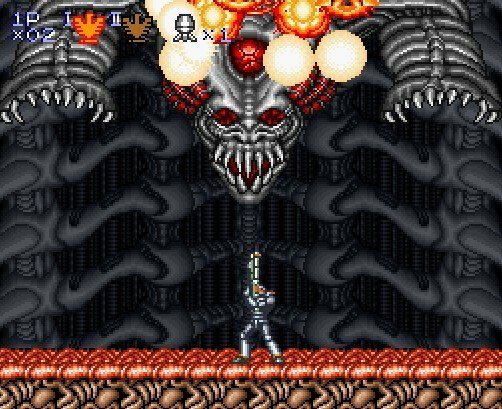 Like a bullet hell shooter it’s just a question of memorising attack patterns and lightening fast reactions. Enemies make take hundreds of hits while you can only withstand one, but reserving the right weapon for the right situation makes things fun. It’s a case of perfecting the game mechanics till even the most elaborate of enemy bullet sponge can be taken care of. Random luck is a help, but it isn’t required to complete the game, an important distinction that makes Super Probotector brutally hard, but entirely fair. With this firm but fair level design comes the addictive quality of the game. No one has ever, completed the game on their first go – now that would be impossible. With the huge variety of the levels, the all action situations and over the top bosses, it takes repetition to learn how you are meant to beat them. 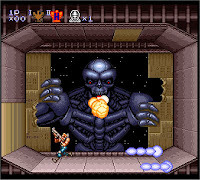 The game constantly asks the player to evaluate the scene, to figure out what is expected of them and then to overcome what initially seemed like an insurmountable obstacle. However if repetition is required to reach perfection there is one thing the game needs to make it less frustrating, even if it would remove the tension –infinite continues (something the Japanese release actually had). You’d be hard pushed to think of a modern game that doesn’t have infinite lives. You get shot in the head, you go back to a continue point. You fall down a hole, back to a continue point. Impale yourself on your own sword, continue point. There is a freedom in modern gaming to take risks, knowing that the penalty for failure is not having to restart a level, all you have lost is a few minutes of progression. I have become accustom to this, I expect it. So going back to a game that has trial and error at its core (and a certain amount of finger dexterity), the penalty for failure seems excessive. You may get 7 lives and 5 continues, but that simply isn’t enough for someone who has limited free time to play thegame long enough to memorise everything. I do enjoy the figuring out element, but I’ll often have to try many more times than I have lives before I understand the process of killing the boss correctly. Being sent back to either the start of a level, or a midway point after each continue is thankfully something that seems to have become a thing of the past. This is why nowadays, I tend to always finish the games I play, where as when originally playing these games I wouldn’t have done. 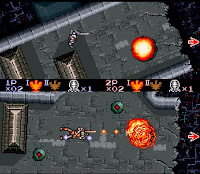 In Super Probotector I doubt I would have made ot to the fouth level even at the peak of my gaming powers. But with this modern need for a safety net comes a modern solution – emulation with its life saving (literally) state saving mode. Essentially this makes the EU game similar to the Japanese one in that I can give myself infinite continues, and as many continue points as I need. 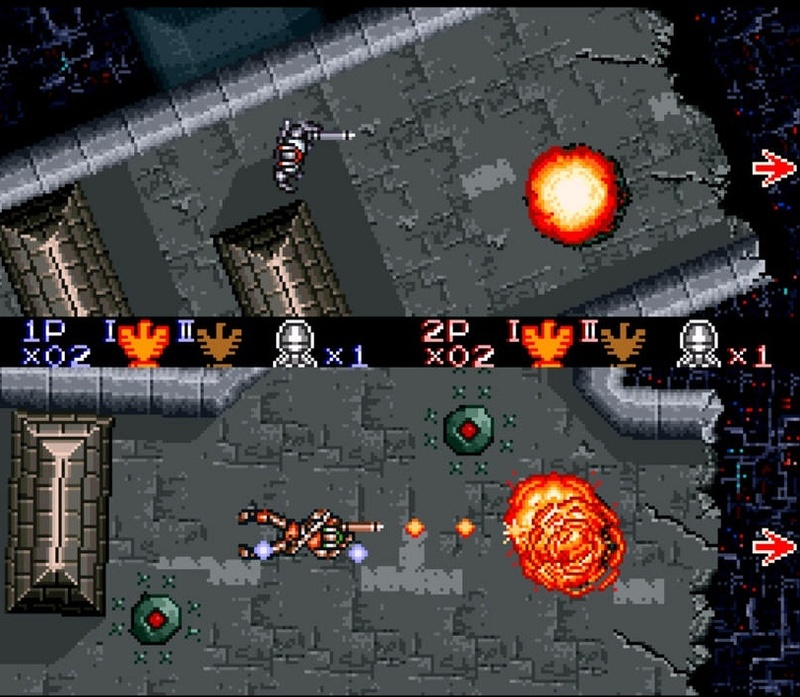 As an early demonstration of what the Super Nintendo was possible of, Super Probotector really is a tour de force. Detailed and smoothly animated player sprites, layer upon layer of parallax scrolling, imaginative use of mode 7 for backgrounds and incidental events. Everything about the game seems excessive in a wonderfully bombastic way. Though it may test the realms of realism, the set pieces too are spectacular and inventive. 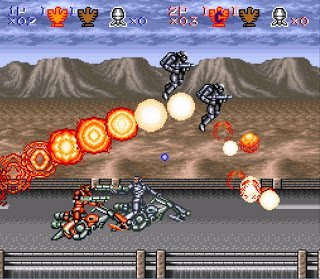 Not just the aforementioned helicopter and missile leaping sequence but also the moments when huge screen filling boss sprites burst through the background to confront the player. The overhead levels maybe glitchy and disorientating but they do offer a change of pace, that breaks up the platforming action. Even without them though, the level of inventiveness and original ideas on show, offer an amount of variety that isn’t apparent in other run and gun games. The problem is of course that with a difficulty curve that resembles a right angle, so few people will actually see the later stages. Rousing metal music, screaming guns and a barrage of enemies, if only the number of lives was as excessive the game would be more enjoyable. I did enjoy my time playing this, though even with my save state abusing technique, I found it frustrating. With time to invest memorising things I’m sure it would be a great game to spend time with, but without a way of jumping to later levels I imagine replaying the first levels over and over again, would become tiresome. While I try to write this blog from a modern perspective its hard not to imagine if I would have enjoyed this when I was younger. While I had faster reaction times then and enough time to devote to this would I have? Probably not, its a slow burn that is only rewarded after an investment in patience, practice and perfect recall. I’m very pleased to have this in my collection, if only to marvel at the art and imagination, but a certain little blue bomber is and always will be my run and gunner of choice. Where did I get this from? Whoever said playing video games is not a social thing is wrong, so of the people I spend the most time talking to I only know from a shared interest in video games. For example, I got this game from a friend of mine who runs an indie game shop in Norwich called Regenrating Gaming. To say that he is a generous guy is an understatement. When I was doing my slightly bonkers charity SingStar event, he was fantastic at raising awareness and money for the cause, and for that alone I am forever in his debt. When I went back to Norwich recently his shop was more or less top of the list of places I wanted to go back to visit. I had mentioned my blog and my desire to collect Snes games to him of course. When I got there he said he had a few left from his own collection he wanted to see go to a good home, both rare, both mint and both classics. The price I paid was ludicrous, so much less than the going rate and it is another reason that I am indebted to him. He may not offer you the same level of discount but if you’re ever in Norwich I urge you to visit Regenerating Gaming. There you will find not only a great selection of games, but also a great guy I’m glad to call a friend. Amiibo - Gotta Catch 'em all! (C) copyright Julian Hill. All rights reserved. Simple theme. Powered by Blogger.